Crap Mariner recently had a post about making changes to ones avatar. I always wonder about people who change skins and hair and their overall appearance on a constantly-chasing-fashion basis... if you turned off labels, could you recognize these people in a crowd? I found myself writing a long comment in response and lo, a blog post was born. Crap's post brings up an interesting thought, how important is it maintain the same appearance? Torley switches around constantly, but he'd definitely be recognizable in a crowd, because while his avatar could be completely different he maintains the same "look" with his color scheme. But most others, you expect them to look like "themselves", over time you get used to how they look and when that changes, it can be a bit jarring. Now, I'll throw on an off the wall avatar from time to time, just for fun, but I still have the same basic avatar that I've had nearly from the beginning, fairly recognizable as Sougent Harrop to anyone who knows me. The shape is the same, though slightly tweaked over time as I've noticed things I don't like about it, trying to achieve a somewhat natural look but still indulge fantasy and look better than I could in real life. The skin I wear is a freebie skin, the caramel van-dyke that I discovered in a freebie box within the first week I was in Second Life. Perhaps not as good looking as some of the stuff you can buy, depending on the light and viewing angle, it has it's flaws. But it's "me", if I change it, change my appearance that radically then won't I cease to be? I have looked for alternate skins but I have found none that match close enough in coloration and aren't overly detailed, I don't want to look like a body builder, hairless with rippling muscles. I've even tracked down the original maker (Sezmra) of the freebie skin I wear and tried the demos for all her other male skins, they were close, the closest I've found, but just not quite right. I actually like the skin I'm in, I just wish it could be tweaked a little and brought up to date, especially in the face, but I like it. In fact, the few times that I've actually tried switching skins, a few people who have known me for a while actually told me that I didn't look right, didn't look like me, which prompted me to switch back. At this point, I'm not sure I could bring myself to switch skins, the replacement would have to be really close before I'd consider doing it. The hair I have, works for me but if I find better, I would change without much hesitation. 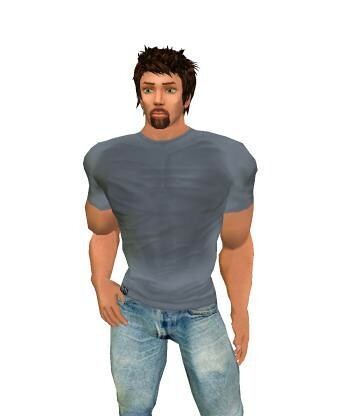 Clothes, I change up with no hesitation, perhaps even more so than most guys in Second Life. But skin, shape and the eyes, those are the 3 elements that make my avatar's persona, if I change them I cease to be, I become someone different. I'm fairly happy with the avatar that has evolved over the past year, maybe someday I'll want to be someone different but not today.